Ongoing publications are noted to present. Please review our copyright declaration or just contact us if you have any questions regarding any copyright information. The Dominican Star is the Student Newspaper, and publication is ongoing. See also the listings for Rapporter and for The Rosarian student newspapers. 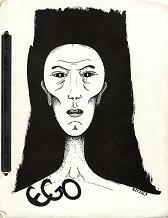 Ego was an irregularly published literary journal, which also included some poetry and non-fiction materials. All of the issues were uniquely bound, some with brads and others with screws and nuts. It is unknown what the full run of the publication entailed, whether number of issues or dates of issues. If you have any information about editions that are not in the Archives, please do not hesitate to contact us. The Parrot was an early student news publication, of which we have scant evidence. 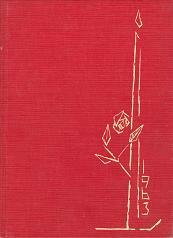 Publication began in October of 1928, and we do not know how long it continued to be published. 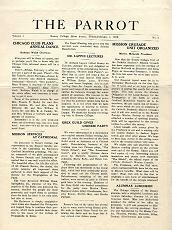 The Rapporter 1, beginning with the September 16, 1970 issue, volume XXXIII, replaced a publication titled The Interim, itself a rename of The Rosarian. The Interim ran for only three weeks, and was christened Rapporter in response to the establishment of a journalism class which was requested by students through a poll of the student body. The renaming took place after a contest administered by the newspaper staff. 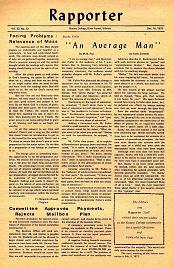 The Rapporter was a news publication that focused on campus events, visiting luminaries and stories of local interest. Publication of the earliest editions occurred weekly, though this schedule became more sporadic starting in 1972. There are no issues of the Rapporter from the beginning of the 1974 — 1975 calendar year. 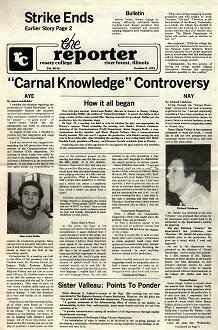 Publication under the title The Reporter begins with the September 24, 1975 issue. In September of 1980 the title changed again to the ‘new’ reporter, yet quickly reverted to the previous name. In the beginning of the 1983 calendar year, the newspaper became Rosary Reporter, and while the name continues to fluxuate with time and temperment, it functionally remains The Reporter for its duration. There are a few non-standard issues as are noted below. We also have a subject and author index for all editions issued between 1990 and 1995. 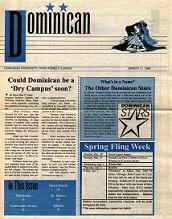 Dominican University's current student newspaper is known as The Dominican Star. 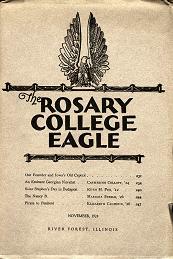 Not to be confused with the Rosary College Auxiliary publication The Rosarian. 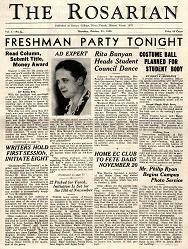 Publication of what became the college Newspaper (known variously as The Rosarian, The Interim, Rapporter, the reporter, and The ‘New’ Reporter) began with the October 17, 1935 issue and was entirely financed and operated by students. 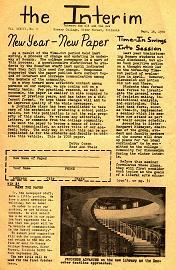 Initial publication was on a bi-monthly basis, with a yearly subscription rate of “one dollar and fifty cents per annum.” 1 Editions were issued on a monthly basis, during the school calendar year. the Interim was published for three weeks in September of 1970 before assuming its new name, Rapporter. 1 Historical information is drawn in part from the reporter cover article After More Than 40 Years, Student Newspaper Still Chronicles History of Rosary College, October 9, 1978. 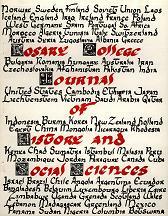 Publication of the Rosary College/Dominican University Journal of History and Social Science began in March of 1980. Issues are sporadically released, with each denoted by the month of publication, with later issues noted by season or by scholastic year. Beginning with the 1997 edition, the name of the journal is Dominican University Journal of History and Social Science. Rosary College undergraduate Yearbooks were known by a variety of names, including R-Year, The Shield, Mortarboards, and The Tas, among others. Since the nomenclature changed so often, we have noted the title after each year of publication. 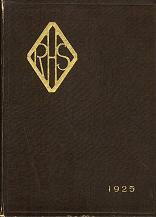 Currently we do not hold or collect issues of the Rosary High School Yearbook. The only issues we have are the for the following years: 1923, 1925 & 1926; these yearbooks are contemporary with the move of the High School from the grounds of Rosary College, and relate to the history of Rosary House and the early years of Rosary College. Rosary High School moved to its current location in 1926, and is now called Trinity High School. If you are interested in finding other issues of the Rosary High School Yearbook, please contact our colleagues at Trinity High School for more information. 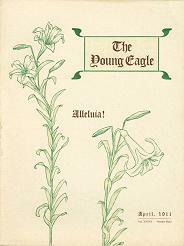 The Young Eagle served numerous purposes during its time. Part social register, part literary magazine, part campus news outlet, one could find anything of interest to the St. Clara Academy community.